The LWVLMR members, delegates, and board met October 3, 4, & 5th in Traverse City, Michigan for the 2014 Annual Meeting. Local organizers Ruth Caputo of Kalamazoo, MI and Mary Lee Orr of Frankfort, MI put together a tremendous program to inform members about the best, science-based evidence of the impact of climate change on Lake Michigan and the region. Dr. Jeff Andresen, Associate Professor at Michigan State University and Climatologist for the State of Michigan, led off the speakers on Saturday morning. He described climate and other trends in the Lake Michigan region. Dr. David (Bo) Brunnell, a USGS Research Fishery Biologist, presented research on how climate change and human-induced stressors are effecting the food web in Lake Michigan. Dr. Kevin Skerl, Chief of Natural Resources at Sleeping Bear Dunes National Lakeshore, promised us more questions than answers in regard to climate change and the future of Sleeping Bear Dunes. Can we anticipate the challenges and respond? Members were offered several field trips, including an opportunity to paddle on the Boardman River. Nate Winkler, Biologist with the Conservation Resource Alliance, opened our program with an inspiring talk about dam removal on the Boardman. 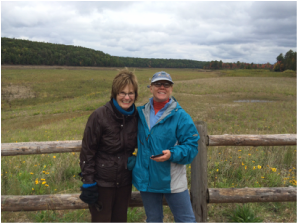 The field behind Eden & Deb had been under water for about a century, but naturally drained two years ago, after dams were removed and the river was returned to its historic course. The vegetation seen here reestablished all on its own! Hover your cursor over the pictures for indentification of our guest speakers & other captions. Thanks to Cheryl Chapman, Deborah Chubb, Krista Grimm, Pam Nelson-Icenogle, & Marjorie Palleon for sharing these pictures! Some League members visited the Inland Seas Education Center in Sutton's Bay, MI for a presentation by Emily Shaw, Education Coordinator, on invasive species in the Great Lakes. She generously shared her presentation with us, as well as related videos.